The Belt and Road Initiative (BRI), a vision to revive the ancient ‘Silk Road’ by means of massive infrastructure investments throughout Eurasia and Africa, was first presented by China’s President Xi Jinping in 2013. China has identified the region of Central East and Southeast Europe (CESEE) as the gateway to Western European markets. This was manifested by the investment in the Port of Piraeus (Greece) and the diplomatic initiative ‘16+1’, comprising eleven EU Member States and five Western Balkan countries, which is interesting for Austria due to its strong economic relations with this region. 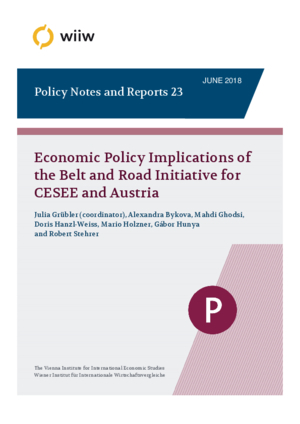 The Policy Brief analyses the most recent developments in trade and investment activities of China, Austria and the EU in CESEE, which are compared to the state of infrastructure in the region in the areas of transport, energy, information and communication technology as well as finance. Overall, CESEE has a high need for infrastructure investments, particularly in the transport sector. Chinese loans and investments in the region are becoming more important, especially for the Western Balkan countries, which have limited access to EU grants. The paper concludes with seven policy areas for future cooperation between Austria and China. The Policy Note is based on a study conducted for the Embassy of the People’s Republic of China in Austria. It is available upon request. Please contact Ms ZHANG Yiran (yiran_zhang@mfa.gov.cn) or Mr CHEN Lin (Chen_lin@mfa.gov.cn).